APT Qualifiers – Players can win prize package to the Asian Poker Tour’s best stops including the APT Manila and the APT Macau. Fort Knox – Sit & Go players who can win six consecutive games can walk away with tens of thousands of Euros in prize money. 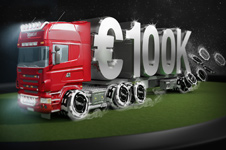 Guaranteed Tournaments – Tournaments where the prizepool is at at least five or six figures, if not more. Weekly Freerolls – new depositors receive four depositors freerolls, new players are invited to daily freerolls, and each month sees a large GTD prizepool bonanza freeroll event.